Science Art: The Dry Frost of Mars. On Mars, the polar ice caps grow and shrink with the seasons, just like on Earth. But unlike Earth, the Martian ice cap is made of CO2. 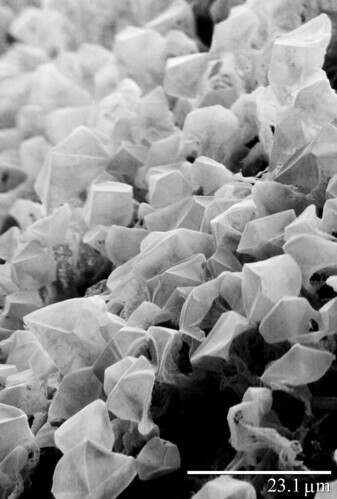 Image from the Electron Microscopy Unit of the USDA Beltsville Agricultural Research Center, captured as part of an experiment in filming Martian frost. Song delayed: penitential cover will be forthcoming.